Parma Ham is an all-natural ham: the only ingredients are Italian pork, salt, air and time. Neither preservatives nor additives have ever been used and the result is a tasty and completely natural product. The pig selected for Parma Ham is a “special” pig born and reared in 10 regions of central northern Italy, exclusively of Large White, Landrace and Duroc breed, and fed on quality food such as maize, barley and whey from the production of Parmigiano-Reggiano cheese. Parma Ham is one of the products that the European Union has decided to protect and promote by setting very precise rules regarding production, use of brands, checks, etc. For the purposes of EU protection, the protected designation of origin “Prosciutto di Parma” was registered on 12 June 1996. An essential condition for obtaining the “Prosciutto di Parma” designation is that the entire process takes place in an extremely limited area that includes the area of the province of Parma lying to the south of the via Emilia at a distance of at least 5 km from it, up to an altitude of 900 m, bounded to the east by the Enza river and to the west by the Stirone torrent. All the climatic conditions that are ideal for drying, namely the natural curing that will give sweetness and flavour to the Parma Ham, occur only in this area. 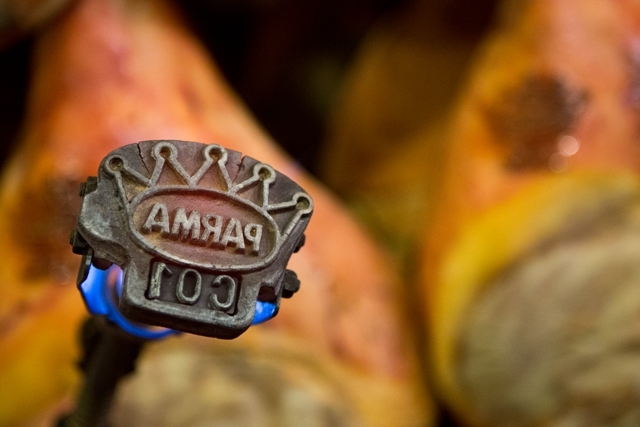 In 1963, the Parma Ham Consortium, an organization of producers (then 23, now 150) who use and safeguard the traditional processing method, was set up to defend and protect the quality of the King of Hams. Since then, the Consortium protects Parma Ham through specifications that lay down the characteristics and production methods of the most highly regarded cured ham in the world. The Consortium ensures compliance with production specifications so as to guarantee a good, genuine and completely natural product to consumers. The Consortium’s signature - the five-point ducal crown - is a true quality mark and a warranty to the consumer. 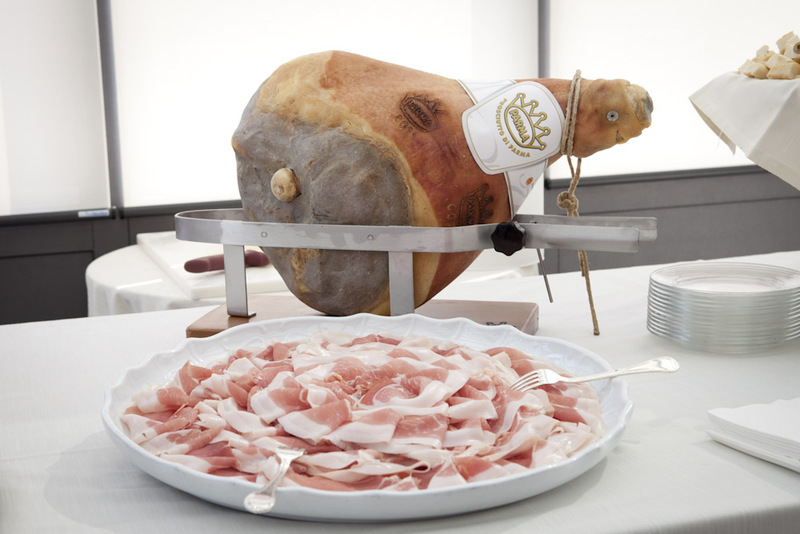 The name “Parma Ham” is exclusively reserved for hams bearing the Ducal Crown, the indelible and unique brand given at the end of the ageing period. Since the fire branding is the final guarantee that all the processing stages have been carried out correctly, the officers of the independent certifying body, the Istituto Parma Qualità (I.P.Q.) are involved. The officers check the ageing period from the registers and the seal on the ham and they ensure that the hams have conformed to all the processing procedures. Finally they test each ham with the horse bone needle and issue a quality judgement based on the appearance, colour and aroma. The analyses carried out by the Consortium in agreement with the Experimental Station for the Preserves Industry and the National Food and Nutrition Research Institute on Parma Ham indicate a balanced combination of high quality organoleptic and sensorial characteristics and nutritional properties that make it a food suitable for everyone including children, the elderly, sportsmen and sportswomen, with low fat content, many mineral salts and vitamins and easily digestible proteins, thus combining a high nutritional value with great palatability and its unmistakable and famous sweetness. The total lipid component is also of good quality, thanks to the high content of unsaturated fatty acids (64.9%), the good fats that are good for health, such as oleic acid (45.8%), a monounsaturated fat, also contained in olive oil, that protects from cardiovascular pathologies. Eating Parma Ham means contributing to achieving the recommended daily amounts (RDAs) of group B vitamins, and also to providing a good amount of precious minerals that are highly bioavailable, meaning they are easy for the body to absorb, such as iron for example. 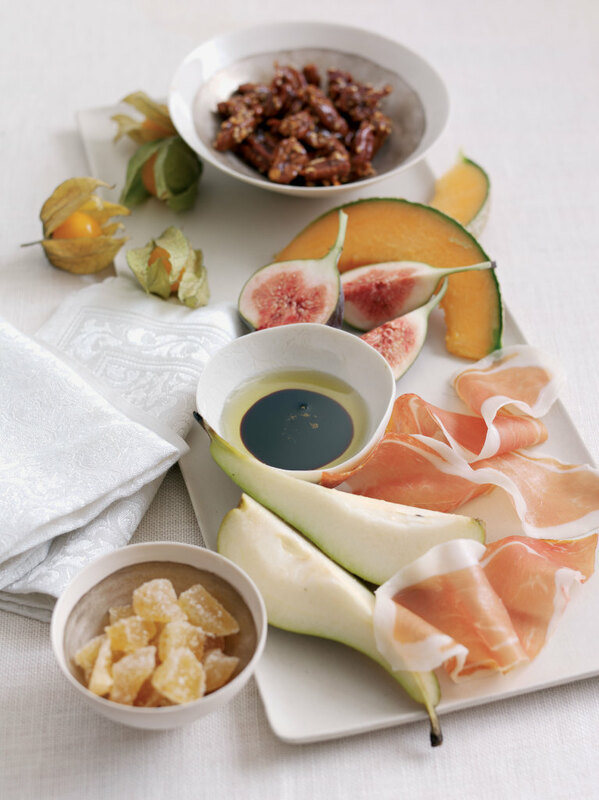 Parma Ham also proves to be an excellent food that helps to combat and inhibit the action of free radicals, the main cause of aging and degenerative diseases, and to restore the physiological balance of the body, thanks to the presence of natural antioxidants such as vitamin E and selenium. The recent analyses have also highlighted the presence of carnosine and anserine: there is a good amount of the first in muscle tissue, for which it controls some metabolic processes for energy production; the other is a substance that is naturally present in muscles and takes part in the antioxidant action performed by carnosine. Parma Ham closes the year 2013 with a total turnover of € 1.5 billion Euros and a production of about 9 million. Over the last decade, the export of Parma ham has grown for 900,000 units. In 2013, a total of 2,500,000 hams with the crown have been exported, with an increase of 2% and a production turnover of 237 million Euros. The most important contribution to this increase has been given by the European market (+3%), while the non-European area is stable. USA continues to be the first export market, with about 500,000 hams, followed by Germany (450,000) and France (420,000). Export in United Kingdom, Belgium and Japan are decreasing. Another exploit for Australia has to be recorded: with 80,000 pieces today it is the third largest market outside Europe. As for BRICS, Russia, with a 51% increase, is the best performance of 2013. The segment of the sliced ​​product continues to be a fundamental building block. In terms of results, more than 1,400,000 Parma Ham have been sliced, for the production of about 73 million trays certified. In the non-European area, in particular, there has been a strong increase in pre-sliced product ​​(+17.5%), with a surge in trays’ sales in the United States (2,590,000), Canada (350,000), Japan (560,000), and Russia with 550,000 units.